Recently, I was having dinner with two incredibly lovely and inspiring ladies who are fellow evolving yogis and somehow the subject of mistakes made in our past came up. Who doesn’t lament, cringe, and shirk about something horrendously stupid we did that we wish could be erased? Seriously, if there were more cameras around when I was growing up and partying like a wild banshee, I definitely could have contributed deeply humiliating behavior to a viral video. But as we try to practice ahimsa, especially toward ourselves, I’m finding using the word “mistake” as being judgmental and hurtful. 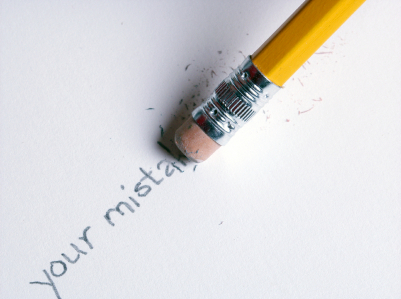 By definition “mistake” is described as “wrong” both as a noun and a verb. Okay…1+1 = 3. Fine. That’s “wrong” because there is a universal arithmetic rule. But living life doesn’t have a plug-and-chug standard formula. If there was, then “individual” wouldn’t exist in our vocabulary. How sad would that be? It’s only in hindsight we gain insight (which is totally annoying that it works that way). In the moment, we have no choice but to act on the combination of information and emotions we have at that time. That’s our best, then. Even look at the entertainment business. They have multiple “takes” when making films and t.v. and they’re working with a script that’s been approved by a whole team of people. Did you know Stanley Kubrick had Tom Cruise do 97 takes of one scene for Eyes Wide Shut? Or that Charlie Chaplin did a scene 342 times in City Lights? They know what the beginning, middle, and end of their story is and yet they allow a multitude of different combinations to be tried. So why do we treat our fumbles in life like a one-and-done shot? We don’t have scripts to work with. We improvise every moment of every day. Can’t we lighten up and give ourselves room to try as many “takes” or “missed-takes” as we need? As an example of how bizarre and surprising life is, who would have ever thought I would quote Bill Maher in a yoga blog??? The point is, we keep trying. And by trying we learn a little more, and a little more, and still yet, a little more as we treat ourselves generously, allowing the freedom to keep learning no matter how long it might take. Entry filed under: Ahimsa, Beginnings, Creating Awareness, Patience. Tags: Ahimsa, Awareness, Being Vulnerable, Judgement, Practicing non-judgement, Spirituality, Yoga.